Tomorrow night I will be attending a charity event to raise funds for the Meningitis Research Foundation. 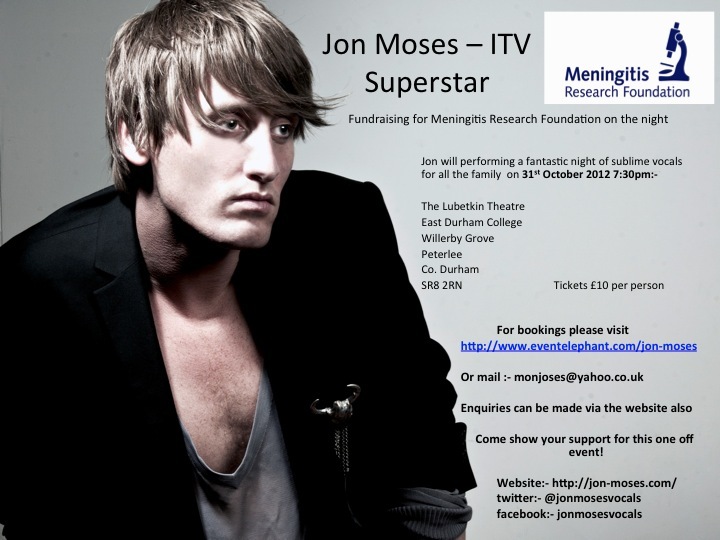 ITV’s Superstar Jon Moses will be singing and helping to raise as much funds as he can as this is a charity that is very close to his heart. Tickets can be bought on the night on the door, all are welcome and I’d love it if any of you in the local area could attend and help this worthy cause. I’m travelling down with my friend for the evening which promises to be a great night of entertainment. If you’re unable to attend then PLEASE help support this cause on Jons Just Giving Page. I know times are hard at the moment for everyone financially but please give what you can. I know I will be digging deep on the night!